A new study of compounds in San Francisco Bay is illustrating a case of chemical whack-a-mole. Fifteen years ago, California banned a class of toxic fire retardants called PBDEs, which were put in household items like furniture and electronics. A year later, PBDEs were banned nationwide. But now, along with these old flame retardants, the new chemicals used to replace them can also be found in the bay. Rebecca Sutton is a senior scientist at the San Francisco Estuary Institute, which conducts studies for the Regonal Monitoring Program for Water Quality in San Francisco Bay. She talked with KQED's Brian Watt about concerns over this new class of flame retardants. Here's what she had to say, edited for length and clarity. PBDEs were banned in the 2000s. What did they do and why were they banned? Polybrominated diphenyl ethers, or PBDEs, were used in really large quantities in a number of consumer products in order to meet some well-intentioned flammability standards set by California. The compounds were meant to make some products, such as couches, less flammable, so that people could escape in the event of a house fire. But it turns out they didn't work so well. Plus we started to see them in the environment and building up in our bodies. They were pretty toxic. How successful was the ban on PBDEs? It's actually been a huge success story for the bay. We've seen a one-third decline of these chemicals in the sediment at the bottom of the bay. In bay fish, we're seeing half the levels we used to. When manufacturers couldn't use PBDEs, they still had to meet the state's flammability standards. So they switched to other chemicals, some of which are used in really large quantities in some typical consumer goods. When we went out to the bay in 2013-14, we checked the water and sediment, as well as mussels and harbor seals, for a wide array of flame retardants. 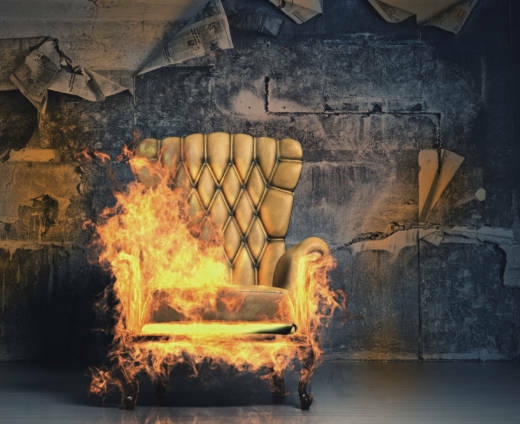 The types of flame retardants we saw that really caught our eye were those that are phosphate-based. They're really water-soluble; they can go right through a wastewater treatment plant and enter the bay. And they're building up in our water and in our sediment. What effects does this newer class of chemicals have on people and the environment? There are a number of different effects, depending on the species. One of the overarching findings that's of particular concern is that these chemicals can have endocrine-disrupting impacts. They can affect how estrogen works or block the path of estrogen in the body of a person or a fish. There have been a number of lab studies showing this, in fish in particular. But there are definitely concerns for people, too. And this can happen at very low levels of the chemicals, because the hormones are active in our bodies at very low levels. Well, a lot of manufacturers would like to not use flame retardants at all. They're primarily using them because of California's flammability standards. Here in our state, we changed one of these standards a few years ago, to where it no longer requires use of these compounds. The new standard is actually more effective in terms of protecting people in house fires. So people are starting to examine the standards to figure out whether these chemicals are actually working, whether we need them in the first place.